Plants and animals often "form the core of what comes to mind when we think about our environment". These two resources are at the heart of much of the conservation work done by NRCS and Soil and Water Conservation Districts to support healthy ecosystems. ​"Healthy populations of plants and animals are critical for life. Invasive plants and pests can ruin crop fields and forests and drastically alter the natural processes of ecosystems." Envirothons are competitive, academic, outdoor team events for high school students which tests their knowledge in: Aquatic Ecology, Current Environmental Issues (CEI), Forestry, Soils and Wildlife. Events are designed to stimulate and reinforce the students interest in our environment and our natural resources while encouraging cooperative decision making, team building and problem solving. ​Students who participate gain a greater awareness of natural resources and environmental issues, a better understanding of interrelationships between living and non-living components of the environment and an increased interest in further science study. Teams consist of five members from the same school and though each student contributes his or her personal best, the score that counts at the end of the day is the TEAM score. Agriculture is the art and science of cultivating the soil, growing crops and raising livestock. ... Higher-technology farming involves crop rotation, which requires knowledge of farmable land. High Schools have the opportunity to form Envirothon Teams for students that in addition can learn concepts of how agriculture and all natural resource areas are interrelated, and how the use of new technologies are key to increase food production. Understand the role of new technology: agricultural biotechnology; precision agriculture; and using UAV (drones, GIS, etc.) to increase farm efficiency for food production. ​Warren County SWCD assists property owners with fly-on cover crops. Call or email our office today to find out more and DISCOVER THE COVER! There are more individual organisms in a teaspoon of soil than there are people on earth. Over 7 Billion People populate the Earth! There is a community of organisms called a soil food web that live all or parts of their lives in soil. See if you recognize them: Photo Gallery (play slideshow). Tilling the soil is the equivalent of an earthquake, hurricane, tornado, and forest fire occurring simultaneously in the world of soil organisms. Many soils are held together by a glue made of protein produced by fungi. The size of soil particles and pores in the soil influence how water moves through the soil. Water and warmth on hillsides can make layers of soil on hillside thinner than soil layers on level land. 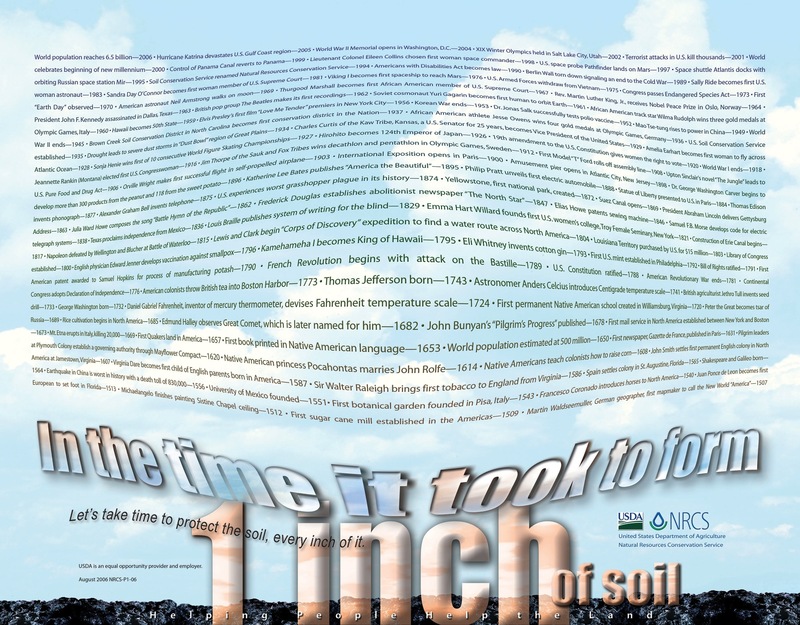 It can take as long as 1,000 years for 1” of soil to form. See what happened in history in just half that time: Poster - "In the Time it Took to Form 1 in. of Soil"
More farmers and ranchers are managing for soil health by disturbing their soil as little as possible, growing as many different species of plants as practical, keeping live plants in the soil as often as possible and keeping the soil covered constantly.